We’ve all been guilty of it… I’ll just have one more bite. But next thing you know, that one extra bite has turned into 20, and suddenly the entire cookie is gone. So keep this chart in mind next time you convince yourself that a few extra bites are harmless, because having “one more” really does matter. Don’t you wish snacking on the couch looked somewhat like this? Well it can if you decide to snack on something a bit healthier for you. Why go for the Doritos when you can be grape-fed? Although the chips may look good now, they won’t look as good on your thighs tomorrow. Instead, try munching on things that are loaded with all sorts of vitamins and are really good for you, like frozen grapes. You’re supposed to be eating tons of fruits a day anyway, so this is a great healthy alternative for a hold-me-over snack. The good news is, you don’t have to feel guilty anymore about going to town on high-calorie munchies because these little suckers are only 70 calories a cup. So stay away from the junk food and try frozen grapes the next time your stomach’s rumbling. They’re tasty, filling and nutritious! It’s simple! 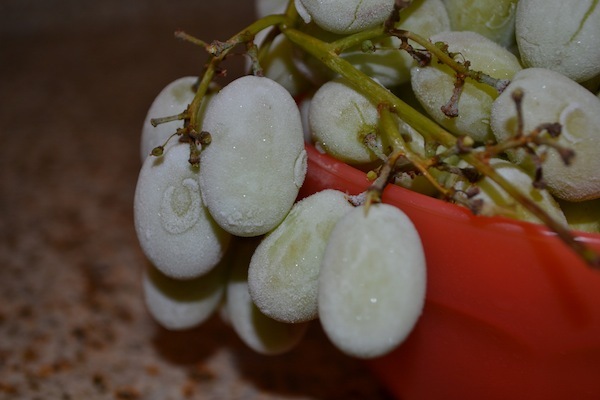 Just buy either green or purple grapes, put them in a bowl or Zip-loc bag and let them freeze for a couple of hours…. … And they’re ready! Although they’re not ice cream, they might as well be. You bite into one and it tastes like you just swallowed a grape-flavored ball of sorbet. TIP: I like to keep them in a bowl in the freezer so I always have a go-to healthy snack whenever I feel like munching. So if you can’t wait for dinner and you need to snack, then snack. Just remember, there’s always a healthier option. Mars and Murries, the inventors of one of the most popular candies on earth, M&M’s, originally named their product after themselves, but I’m convinced these two candy gods labeled the chocolate with an evil subliminal message: Mindless Munching. 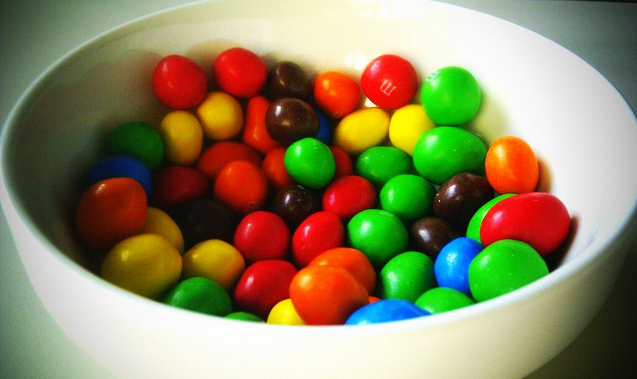 Along with nuts, M&M’s are a great social treat that are commonly served in large bowls at a bar or at a friend’s BBQ. They’re perfect because they’re small enough to quickly chow down so you can continue socializing with others. But just like that, you’ve become a mindless munching machine, oblivious to the amount of candy you’re actually consuming. 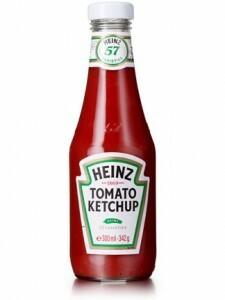 Subconsciously, you keep eating, and it’s okay because just one little piece can’t do any harm- it’s so tiny, therefore, it contains only zero calories. 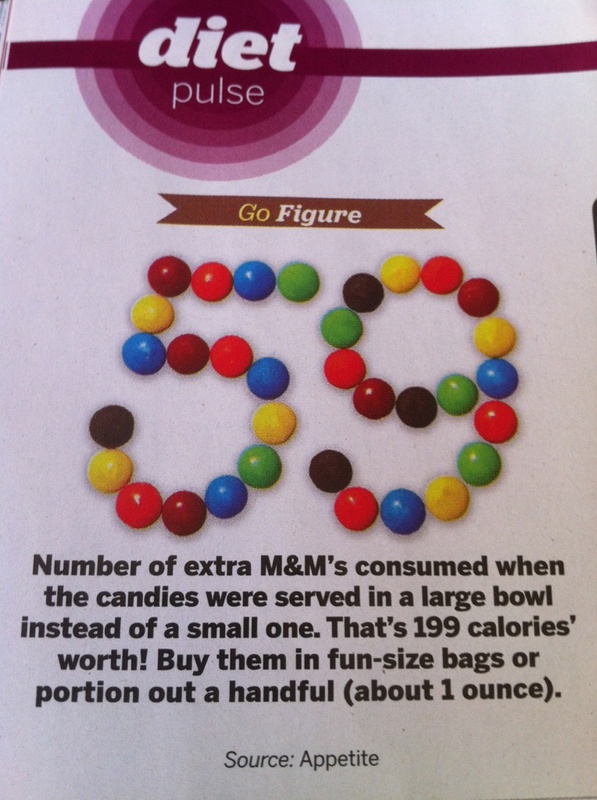 NEWS FLASH: If you do the math, one single ityy-bitty M&M is about 3.5 calories and one bag has around 70-80 pieces (around 260 calories), and Fitness Magazine reports that on average, people consume 59 extra M&M’s when eating from a party bowl, and that’s almost 200 extra secret calories you had no idea you were even ingesting. So you see what I mean? M&M’s are evil. 3. Don’t do what your friends do. Numerous studies have proven that a friend’s eating habit can heavily influence your own, whether they eat healthy or not, and this is because we tend to “mirror” what other people do subconsciously. So make sure you’re not playing ‘follow the leader’ next time you’re at lunch catching up with your high school pals. “You have to be very mindful of who you’re eating with and how fast they’re eating,” says Albers. So there ya go! Now let’s make M&Ms stand for Mindful Munching. “When you’re mindful, you’re more in charge and in control of what you’re eating,” says Albers. From pre-packaged diets to Jenny Craig, it seems that almost everyone is on some sort of diet these days, but do they really work? According to statistics, approximately 50 million Americans put themselves on a diet every year, but only 5 percent of these dieters successfully keep off the weight, and experts say it’s because restricting certain foods while dieting can cause people to crave them even more, which often leads to “destructive behaviors,” such as overeating. It’s kind of like when someone tells you not to look inside of that box. It’s funny how you didn’t even realize that the box was there in the first place, but now you’re dying to see what could possibly be inside… just because someone told you not to look. 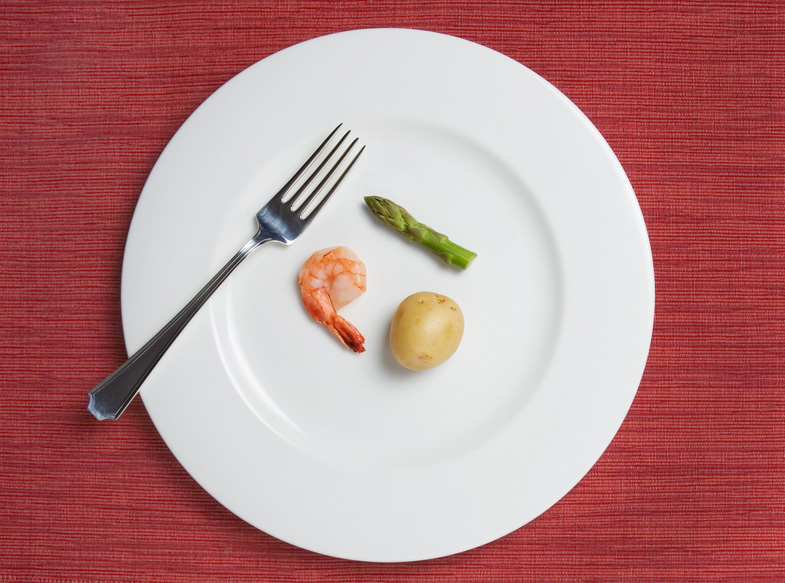 This restriction leads to temptation, and dieting can have the same don’t-look-in-the-box effect, says Wright, which ultimately detours people from their meal-plan. So are we doomed if we can’t diet? Nope. “Don’t have anything bigger than your fist,” says Mark Desh who has been a personal trainer at 24 Hour Fitness in Los Angeles for 3 years. “All your portions should be that size,” as he holds his fist out in the air. The trick is to eat less but more, says Desh. In other words, cut your portion sizes in half and have about five-to-six “small meals” a day. Chris Capparelli, 55, a mother in Villa Park, Calif., lists off a few of the countless diets she has tried in the past, including the Lindora Scarsdale Diet and Nutrisystem, but three months ago she decided to ditch all the weight-loss programs and start focusing on the size of her meals. “It took me 8 weeks to lose 10 pounds…. but it hasn’t come back,” say Capparelli who adds that she’s lost a total of 16 pounds since cutting her portion sizes. “It’s better because it’s real life, not fake [weight-loss] shots. It’s more of a life change,” and that helps keep the weight off. 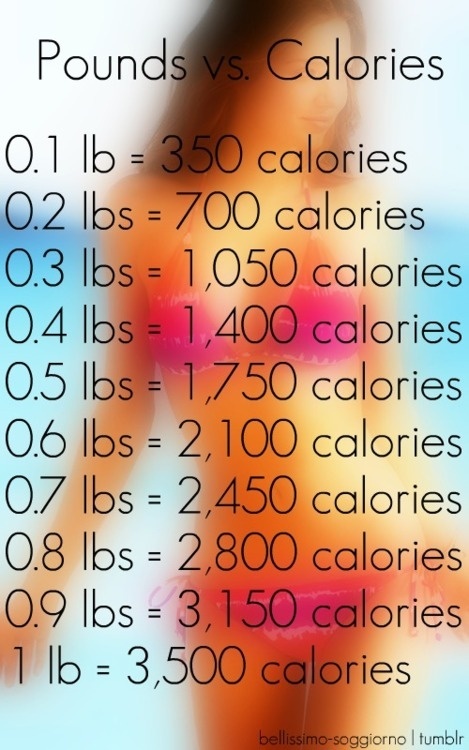 So don’t deprive your body if you’re trying to lose weight because chances are, you’ll just be another statistic. Whether it’s the size of the chicken breast or how much rice you put on your plate, as long as you’re having Knuckle-sized portions, you can eat whatever you want six times a day! Nice. You’ve heard it a million times – breakfast is the most import meal of the day. But is it just me, or does it seem like almost every breakfast option we have out there isn’t so healthy for you? We have pancakes, waffles and muffins (which are basically morning birthday cakes), sausage and bacon (grease central) and cereals (and those tend have too much sugar in them). And for me, sleeping in ’til the last possible minute and spending extra time on my hair are the most important parts of my morning, so I don’t have time for breakfast. I’m usually stuffing my face while rushing out the door with some sort of on-the-go meal, like my favorite: the bagel with cream cheese. 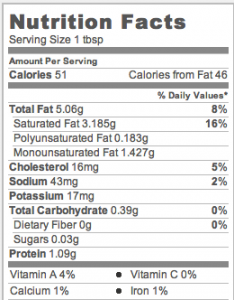 But even those are realllly fattening, and they usually contain around 200 calories. But wait, there’s more! Then you spread the cream cheese on top of that, and the calories are doubled! Annoying. 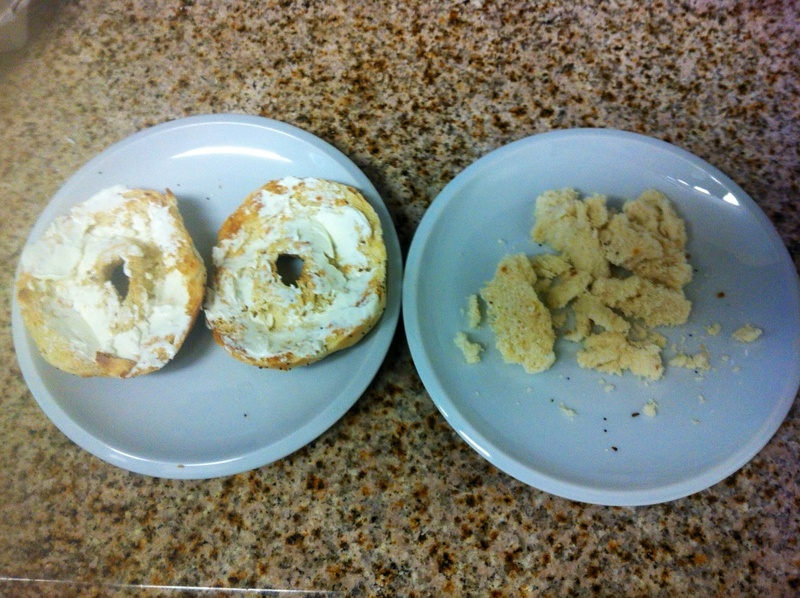 Well, I don’t got the time to make myself some eggs, so sorry, I’m eatin’ the bagel with cream cheese… with no regrets. 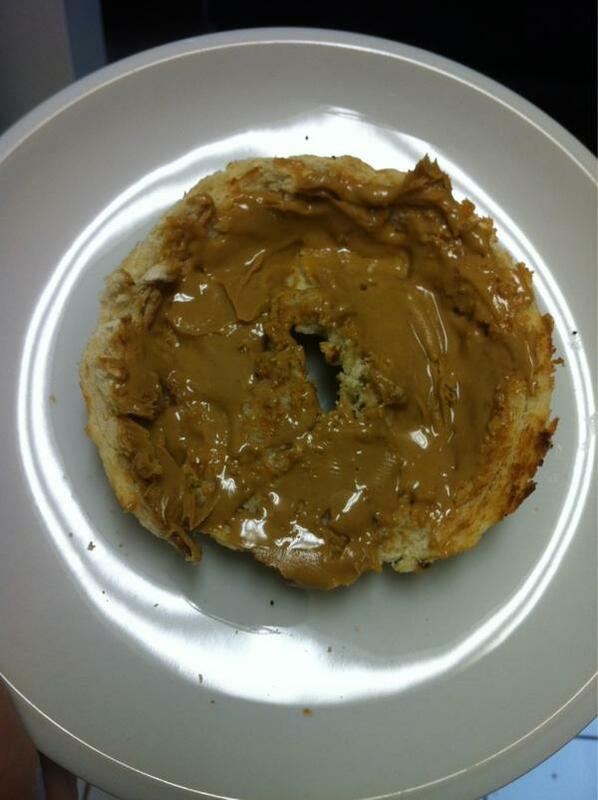 My tip for when you chose to eat a bagel for breakfast: Make it a doughless one! … and Viola! There goes half the carbs! 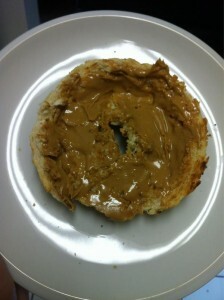 So if you gotta eat it, eat it… just make it slightly healthier. 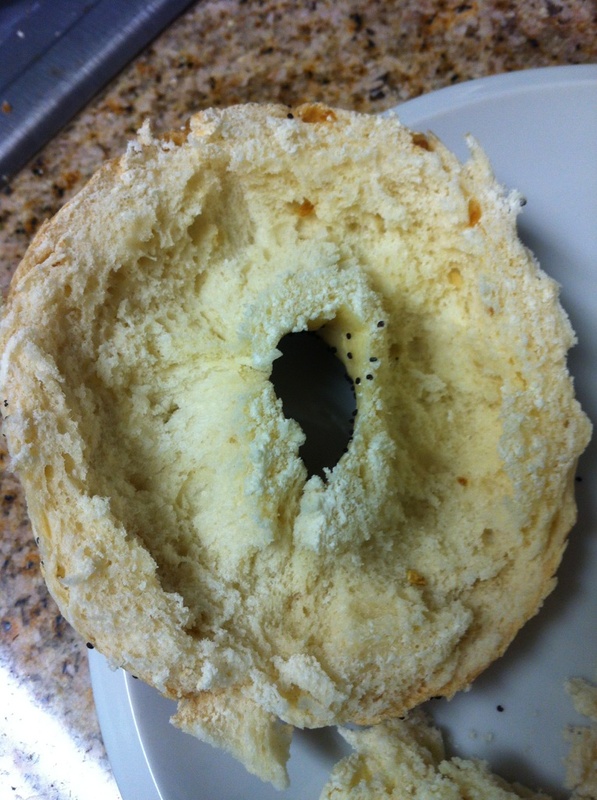 And if you’re at a breakfast joint, don’t worry, just ask them to make it doughless. Lots of restaurants will do it for you. 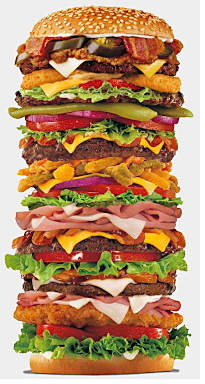 If we lived in a perfect world, hamburgers would taste like dirt so we wouldn’t have to crave them or have our thighs pay the consequences for chowing one down. But unfortunately, burgers are near and dear to all of our hearts (excluding vegetarians of course) and it seems we just can’t stay away from them, according to statistics, which reveal that the average person consumes around 150 hamburgers per year. It may seem like a lot, but it makes complete sense… we eat them all the time! Whether you’re on the go on a long road trip or at a friend’s birthday BBQ party, hamburgers satisfy the I-need-food-quick and the mouth-drooling-deliciousness most Americans strive for. And especially being Labor Day, today will be an excuse for most people to inhale as many burgers as they possibly can. For the most part, burgers are irresistible and impossible to avoid, so when you gotta eat it, eat it. But here’s a few tips to make your burger experience a slightly more healthier one. 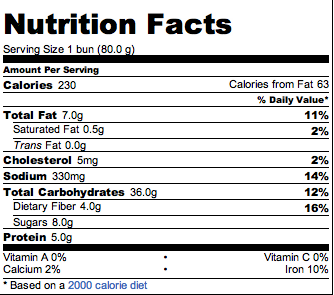 Hamburger buns are loaded with fats, carbs and sodium. Taking off just one bun can cut half the calories coming from the bread, and I promise you, the burger tastes just as scrumptious. And if you’re up for it, take off both and make it a bunless burger! The less carbs, the better. Hamburger-bun calories range from 90-300 calories. 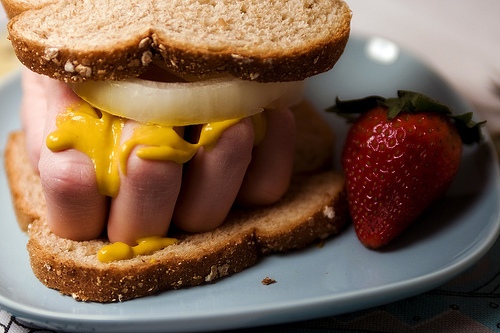 And it doesn’t just have to be hamburgers, I do it with sandwiches too. Cheese, too, is packed with fats and sodium that just aren’t beneficial to our health or bellies. 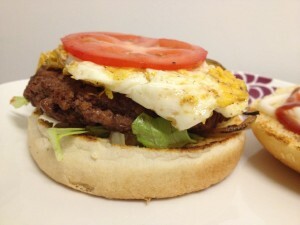 Instead of adding cheese to your burger, add the nutritional stuff like onions, tomatoes, and lettuce. Good: These sauces have no sugar, no fat, or contains healthy fat. So have a healthy hamburger this Labor Day! 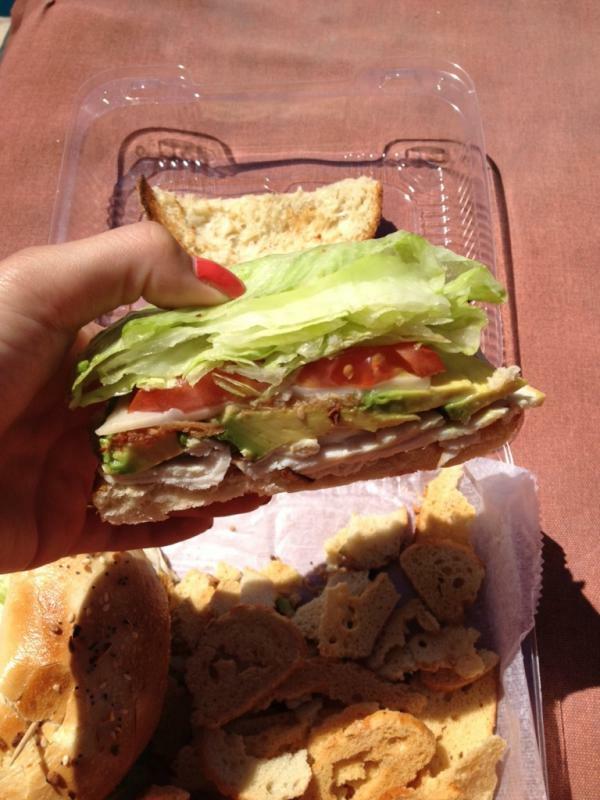 And don’t forget… it’s always best to choose wheat buns over white and turkey burgers over beef!